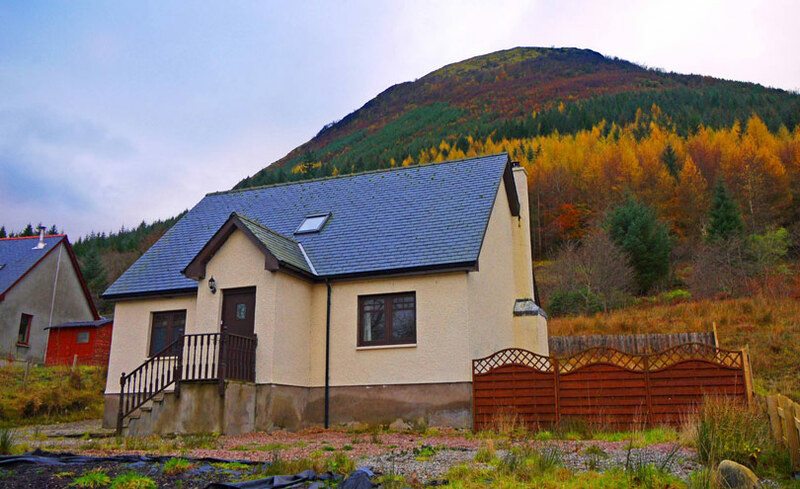 The Highlands Small Communities Housing Trust (HSCHT) ‘Rent to Buy Scheme’ helps people on low income living in the remote highlands of Scotland to find an affordable home. At the heart of the scheme is a financial mechanism which enables low income families to save up to buy a home whilst they are renting it. The main aim of this programme is to provide local people in some of the remotest communities of the UK with access to affordable housing and to ensure that the houses that are built remain affordable into the future. The benefits of the scheme extend beyond those who buy the homes. Local contractors benefit from the construction work when the houses are built. Indeed the scheme specifically targets small local building firms. HSCHT also supports training and development and provides a route into apprenticeships for local young people in rural communities. This support is provided in partnership with the University of Highlands and Islands and the contractors employed to deliver Rent to Buy properties. Rural communities retain a greater mix of people, helping local employers retain staff. The affordability of the homes is protected over the long term through a legal mechanism. Local authorities also benefit from reduced pressure on the housing waiting list. 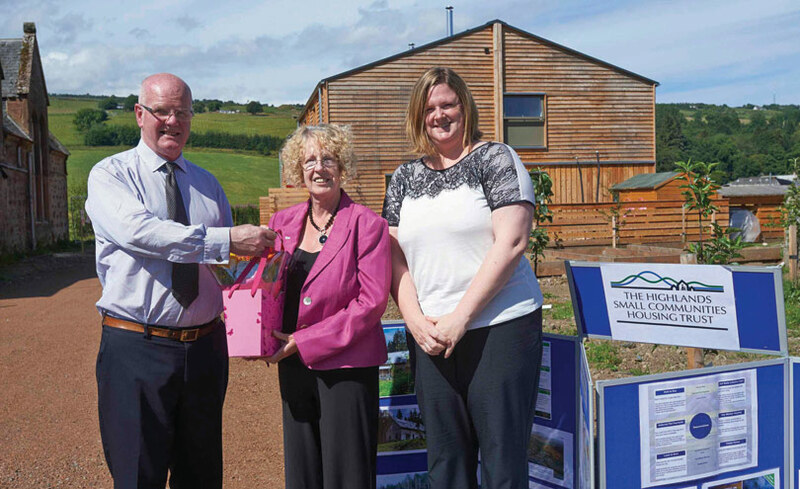 The Rent to Buy Scheme is one of a number of approaches used by the Highlands Small Communities Housing Trust to help small rural communities access affordable housing. The model was designed by HSCHT and is being delivered in partnership with the Scottish Government and the Highlands Council. The scheme builds new houses and lets them to families at below market rents. Part of the rent is retained by HSCHT and is available as a lump sum that is used as a deposit to buy the house. The scheme is self-financing and does not require a government grant but is supported with development loans from the Scottish Government. The Scottish Highlands is a huge area covering much of the North of Scotland. As its name suggests it is a mountainous, remote and undeniably beautiful area. It is one of the most sparsely populated parts of Europe, comparable in population density only with Northern Sweden and Finland. The area has become increasingly depopulated over many years. The Highlands has a thriving tourist industry, which provides employment but does create distortions in the housing market. A large amount of the housing stock is used as second homes and holiday lets. This limits the amount that is available for the local population to rent or buy. The problem is particularly acute in the summer when tourists and seasonal workers in the tourist industry occupy much of the available housing. The effect of this is many local people are forced into inadequate or inconvenient alternatives (for example using caravans or ‘sofa surfing’). Many families unable to find decent housing choose to leave the area altogether. Since the economic crash of 2008, the availability of mortgages has become much more restricted in the UK. In particular lenders require large deposits (often 25 per cent of the house value) before they will offer a mortgage. House prices in the Highlands vary, but because incomes in rural areas trend to be lower than in urban areas, the ratio of incomes to prices makes renting and buying expensive. For families, repayments on a mortgage remain comparable to the price of renting. This means that many families who could afford to buy a house are unable to do so because of they do not have enough savings to pay the deposit. Rent to Buy is a financial model which provides affordable access to home ownership. Tenants rent a property through the scheme with the option to buy it after five years. If they take this option they get a cash-back sum to help them with their mortgage deposit. The selling price is fixed, based on its value at the beginning of the five year term. This provides certainty for tenants and a potential benefit for them if the house goes up in value. The scheme uses loan finance so the funds can be recycled. Interest on the original loan is repaid on the sale of the home making the scheme cost neutral. Rent levels are set so they can be covered by state benefits if the household has a low income. This means that tenants have a safety net if their income drops or they become unemployed during the scheme. Affordability is protected using a legal mechanism (called the Rural Housing Burden); this gives HSCHT the right to purchase the property back from the owner if the owner decides to sell it. It means that HSCHT can allocate the house to another family who fits the criteria at the same equity share. This mechanism protects the future affordability of the property. The scheme has provided 30 new affordable homes, with another 34 under development. 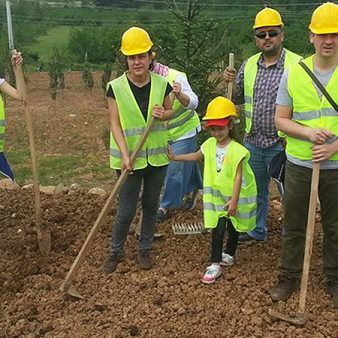 In 34 small communities, housing 143 people and helping to sustain rural communities. Twenty-two local construction firms have been involved in delivering the schemes. Many have strengthened their links with local communities and have been able to protect their employees and retain their workforce. Young people have also had the opportunity to access training with contractors. Funding has been agreed for a further phase. HSCHT are identifying sites and carrying out feasibility and financial viability studies. The project has helped to raise awareness and increase the focus on rural affordable housing delivery both locally and nationally. The cost neutral nature of the scheme has drawn considerable interest as reductions in government subsidy on housing have been introduced in Scotland and other parts of the UK. The Scottish Government is keen to see the scheme made available across Scotland. The affordability of the housing has been protected by the ‘Rural Housing Burden’, ensuring that the new properties remain available to local people and aren’t sold on the open market. HSCHT uses small local contractors and supports local business wherever possible. The houses are modern in design, and use large amounts of timber in their construction. This reduces embodied carbon and allows the houses to be highly energy efficient. Although designed locally, many of the houses look very different from traditional local houses which tend to be built from rendered stone or brick. HSCHT supports local employment and training by working with the University of Highlands and Islands allowing contractors to set up apprenticeships for local young people. Community engagement sits alongside the process of delivering Rent to Buy homes. In particular communities are able to feed into allocations policies so that they are able to take account of specific issues (such as a need for key workers like teachers or carers). The Scottish Government provides a development loan to cover the house building costs for the scheme. They have so far provided three loans to cover three building phases. For each phase the loan is due to be repaid after six years. The rental income covers the interest on the loan, maintenance, insurance and provides the cash back reserve paid to the tenants when they purchase the homes. HSCHT retains any surplus to contribute to its overheads. The project achieves the remarkable feat of providing high quality housing at a below market price without the need for government grant. The model is transferable and can be used by others, for example communities or local businesses. The approach also supports the rural economy. Building contracts allow and encourage the use of local contractors. For households in need of affordable housing with limited access to finance, the cashback element of the scheme gives them a deposit. This accumulates from rental payments over the five year rental period, meaning households don’t have to stretch themselves financially. A fixed price at the outset gives certainty to households using the scheme. 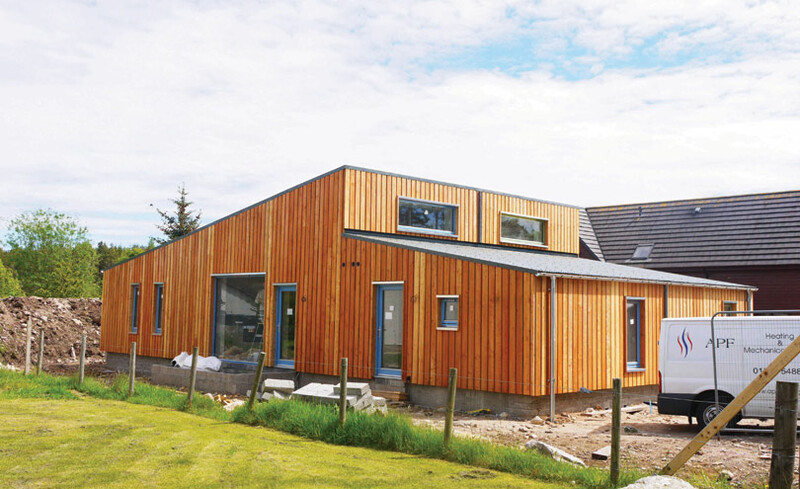 In the Scottish Highlands the weather can be particularly challenging and a focus on high levels of insulation, air tightness, suitable heating systems and the use of renewable technologies where needed (for example photo voltaic panels) have been encouraged on all builds, all of which reduce the running costs of a home. The first phase of the Rent to Buy Scheme includes seven different developments. Each contractor chose their own house design as appropriate for the site conditions and location. Features include careful design and siting to reduce wind cooling and to increase passive solar gain; high levels of insulation; elimination of fabric thermal bridging and high levels of air-tightness; wood fuel stoves with back up electric heating; low dual flush WC’s; and flow reduced/aerating taps and showers rated at no more than 6 litres of water per minute. The use of local contractors and local materials also reduces the overall carbon footprint of building activity. The Rent to Buy Scheme is self-financing. It creates an income through rent payments and the sale of the houses. The income pays for the cost of running the scheme and allows funds to be reinvested into building new houses. The scheme generates a predictable income for HSCHT. This has enabled them to retain a skilled staff team. The scheme has helped to raise HSCHT’s profile within communities and with local and national government; providing greater funding opportunities for other projects and schemes. The use of local contractors ensures as much of the investment as possible remains and circulates within the community and supports other local businesses, shops and services. HSCHT works with a network of councils and other bodies such as local development companies – these partnerships have helped to identify a hidden housing need within rural areas. Building more affordable homes in hard to reach rural areas reduces the pressure on more highly populated areas. It also strengthens informal care networks and helps to retain key workers locally (key workers provide essential services, for example health workers, fire fighters, teachers or police). Not only do these benefits reduce costs for central and local government, they also ensure an improved quality of life for people living in rural communities. Affordable homes help communities retain families with a range of incomes and skills. Training and development provided through the scheme also improves opportunities for young people in rural communities. Land needs to be purchased at well below market value. This limits the scheme to places where either public land can be transferred or where there are legal obligations, or where a local landowner is prepared to sell land at a greatly reduced price. The scheme relies on low interest rates on the loan capital; this was provided by the Scottish government. The scheme also relies on mortgages being affordable for families taking part in the scheme. The UK has benefited from low interest rates in recent years. A rise in the future may affect the attractiveness and viability of the scheme in future. Some mortgage lenders do not lend on properties with the Rural Housing Burden. This narrows the range of lenders for purchasers. For Phase 1, there was a short window of opportunity to use “underspend” funding provided by the Scottish Government, so the final project had to be drafted over just four months. This included land purchases, providing a certificate of title for each of the landholdings, assessing total project costs, potential cashbacks and selling prices, agreeing loan drawdown schedules and creating the draft offer for each tenant/purchaser. The topography of the Highlands creates challenges for building, for example where there is a steep slope. On one site this was addressed by building into the hillside and on another by building a house on stilts. This added to the building costs. 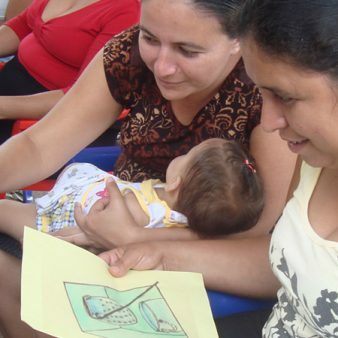 Talk to as many local partner organisations and involve them wherever is feasible. They could have land, expertise and/or access to finance that may be useful. Carry out extensive feasibility work to make sure sites are viable and identify any development issues prior to starting construction activity. Some sites will be rejected but budget overspends will be prevented. Build in a realistic contingency in the financial assessment – there is always something unexpected. A clear design brief should be provided to contractors at the beginning. Smaller firms can be encouraged to tender for contracts through flexible procurement processes. In working with local contractors allow flexibility in the contract. Delaying the start of a build by a month or two may allow the contractor to meet the contract terms more easily. Maintaining open communication channels is important. Working with local contractors is worthwhile in challenging build environments – they are more aware of local issues and can come up with inventive solutions. Continuously look out for potential future building sites. Always have a few back up sites in case additional funds become available. In 2015, the Scottish Government carried out an evaluation of the project to explore the possibility of rolling the model out across Scotland. This has yet to be published. Follow up surveys with tenants will be carried out after around 18 – 24 months of moving in to their homes when they will be asked to quantify (as far as possible) the impact of access to an affordable home on them and their family. A second and third phase have been agreed by the Scottish Government and this will extend the scheme to more areas of the Highlands. The Scottish Government are keen to use the model across all areas of Scotland. Other organisations have also been keen to find out more, for example, communities looking to invest community benefit funds, community landowners and other housing providers, such as Housing Associations. So far (in 2015), no other organisation has adopted the scheme but the Scottish Government is supportive of the housing model and may use it in other areas in the future. Community-led housing: What is it and what can it offer your local authority?